Our time in the Rhone is on the one hand hardly worth writing up, yet even just a few hours passing through with a couple of brief stops left an impression on me. Rhone wines, particularly the southern Rhone, were among my first loves in wine. I could afford Cotes du Rhone and I quickly learned about less prestigious villages like Rasteau and Vacqueyras that we're much pricier, at the time any way. Of course, Chateauneuf du Pape the king of the south, and there's the whole other story of the Northern Rhone, which will have to wait until another time. 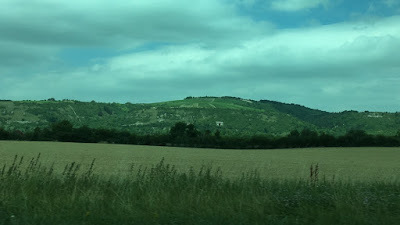 For now, just a blurry pic from the autoroute as we headed by Cote Rotie. Still gorgeous. Our goal for the day was Roman ruins on the way to Provence, so we stopped for lunch on the plaza in Orange, across from the incredible Roman amphitheater. After lunch we hiked up the hill to a look down into the theater. From Orange, we were so close to Chateauneuf that I couldn't avoid a detour to return where I'd visited back in 1994. And if I remembered correctly, we'd have a nice look from the hilltop there across the entire southern Rhone valley. The wines of Chateauneuf we a favorite of my paternal grandfather, and the name always stuck in my mind. When I came to France in 1994 I'd already discovered my wine passion, and I had a memorable day trip here from Avignon where I saw for myself the intensely rocky vineyards I'd heard this region was known for. We drove to the castle ruins and looked around, the air warm and dry with a loud buzz of cicadas. TO the south and west you could see the Rhone and Avignon. TO the east, the rolling countryside, the Dentelles of Gigondas, even the bare rock summit of Mont Ventoux in the distance. I wandered up the road a bit to see the vines of Ch. Maucoil up close. Their vines abut the ruins and show the rounded boules of this ancient floodplain. Vines are typically head trained unlike the vertical trellis common in Burgundy, the wines here warm and stony, at their best a more heady and totally different but no less elegant wine than great red Burgundy. I wanted to stop to taste somewhere but the day was fading and we still have a ways to go. I thought of a handful of bottles from this area back in the home cellar, and plans to drink them soon and think of this afternoon stop. My importer in Quebec connected us to another producer he works with, Bertrand et Axelle Marchard de Gramont. We met with Axelle, who did a fantastic job of explaining things in English. My French is shamefully bad beyond some key travel phrases. This domaine occupies a nice chai in the Haut Cotes town of Curtil Vergy. They work approximately 7.5ha of vines mostly in Nuits, with some nice holdings in Vosne and a bit of Aligote coming from close to the winery in the Hauts-Cotes de Nuits. The scale here is familiar. They work several vineyards, mostly pretty small parcels, then vinify and age things nearby in (I believe) a leased facility. Here we were, meeting to taste the line up amid the barrels just like I'm usually doing with visitors to the Eola Hills. I taste in the US regularly, but it was fun being a guest in a French winery to see what's similar (pretty much everything) and what's not. We tasted through a line up of 2015 releases, starting with bottlings from Nuits, then moving to the two bottlings they did in 2015 from Vosne, and finishing with the refreshing Aligote. The wines impressed. 2015 is undoubtedly a riper year but there was still such freshness and fine grip amid the darker colors and almost overt fruit of the vintage. I preferred intensity of the older vines Nuits Vallerots to the younger vines (all of 15 years old) and a slightly more herbal expression in the Nuits Terraces de Vallerots. The Nuits Aux Allots showed a bit of reduction but that should work though. The Nuits Les Hauts Pruliers was the star, with lovely grace amid a firm structure. We finished with two wines from Vosne. The first is a blend of several tiny parcels they work, all village level. Lovely wine, not as different from the others though that might be the strong imprint of the vintage. Then there's the special bottling from 2015. B. & A. Marchard de Gramont usually only bottles one Vosne wine, but in '15 they separated out a small bit from Les Barreaux high on the hill above Richbourg and next to Clos Parantoux and Petits Monts. The exposure at Barreaux turns to the north, so it's merely village level, but this is different terroir than most village wines I think. This bottling was stunning. Rich and delicate, structured but supple, really a fine wine that I was delighted to try. As we were purchasing, I asked about white wine and Axelle remembered she had Aligote in the fridge, so we quickly tried it. What lovely, refreshing white wine with a strong earthy character of good Aligote. We added one on to our order and enjoyed it over a few nights as an aperitif. Saying our thank yous and goodbyes, we headed back down to Nuits and back to our Gite for the evening. It was late afternoon now and I was compelled to drive up on the small roads in the vineyards for a better look around. We were in the southern part of Nuits, where if you look high on the flank you'll see the terraces of Vallerots, a distinctive site we'd noticed on our way to the winery. We stopped and looked around from the mid slope, hardly a cloud in the sky on a warm June day. This felt familiar, not the grandeur of the Cote but the dust of the soil, vines on a slope in the late day sun, pea sized berries gently shaded by a canopy not aggressively stripped of leaves. It felt so good to be there, even if we would be off to the south in the morning. Now to plot a return. We stayed at a Gite outside of Beaune, a perfect way to experience French country farm life in the flats east of town. Like the bottomlands of the Willamette Valley, this is wheat and corn country. We felt right at home. We ate in one night after a great stop at the Beaune farmer's market in the old town on Saturdays. The other night we dined at Bar on the Square on just across from the old city wall on a small plaza off the ring road. It came recommended from my importer in Quebec, who said all the winemakers hang out here. I didn't recognize anyone, of course, but the wine list was terrific and the food was just what we wanted on a warm evening. After dinner we wandered through the old city streets back to the car, which I somehow parked far away not knowing exactly where we were going. It was simply a perfect evening in Burgundy. After a week split between Paris and London, we returned to Paris to rent a car for a week two adventure south. First stop Burgundy. On the way, my wife happened to pick Auxerre for a lunch stop. It was close to the autoroute and gave the family our first chance to see smaller town France after days in the big cities. We enjoyed a quick lunch and then I dropped into a local wine shop, saw a bunch of local Irancy wine. We were on Burgundy's doorstep. On the road east to meet up with the autoroute I saw my first vineyards of the trip. The countryside around Auxerre made me think of Oregon, without the evergreens. But France has considerably rockier soil than home, making me think of Joe Dressner's chiding about the fertile soils of the Willamette Valley. They aren't fertile in the hills where we grow grapes, but that also certainly don't look anything like France. We re-entered the autoroute toward Braine but turned off early to head directly to Gevrey at the north end of the Côte d'Or. from highway to country road to windy country road twisting though the mountains above the Cote, we noticed preparations underway for the Tour de France stage passing this way in a couple of weeks. Suddenly we descended in a combe and we saw vines everywhere, to our left high on the slope I was sure to be looking at Clos St jacques and Cazetiers. Then on through the small town and we turned right onto the Route des Grands Crus. We were here. I pulled the car to the side of the road to take in the landscape. It was an emotional sight, this perfect slope, covered in vines, a place I'd studied almost forever in words and maps but was only seeing in person for the first time. I just stared, mouth open, no words. I noticed so many things. The rocky dirt, the thick vine trunks, the low canopy, meticulously hedged, and that marvelous exposure, the slope glowing in the afternoon sunlight. It's obviously perfect for Pinot Noir. Soon enough we got back in the car and continued south to Morey and beyond, me trying my best not to swerve off the road as we passed by so many old friends I was only now meeting in person for the first time. The towns of the Cote du Nuits are just as I'd read - small, sleepy, not so grand compared to the world renown dirt all around. Soon we came upon the Clos Vougeot, the largest Grand Crus in the Cote du Nuits, and indeed remarkably flat and perhaps unworthy of such status as you proceed south. The northern end however is perfect, and again perfectly exposed on the slope. There's little shade in the finest vineyards of Burgundy. Through Nuits, then the quarries of Comblancien and on to Aloxe and the great hill of Cotton. It's bigger than I expected, high and essentially a huge flank of vineyards tilting east. If only I had more time to explore up and around to Pernand and Savigny. That will have to wait. So into Beaune, our terminus for a few nights as we explored the region. More on dinner out in Beaune and a producer visit back in Nuits next time. June saw my first visit to Europe since the 1990s, a shamefully long time ago given my profession as a winemaker. I suppose I could say I've been been busy. I'm married with two children, now teenagers, and for many years I was the primary earner for my family. I worked in higher education. I was apprenticing in wine. The time and cost of international travel simply didn't fit. Or perhaps those are excuses. Whatever the case, my family and I are recently back from a two week survey of France, mostly, with excursions to London and the Piedmont of Italy. What a trip, busy but relaxing, family instead of wine focused as we played tourists most of the time. Of course I did manage some winery visits, much sampling of local products as we went, and despite the brief stays in each region we visited, I return full of inspiration. To write, to re-evaluate my approaches in the vines and the cellar, and certainly to return much sooner to my vinous homeland. Week one was mostly Paris and London, with a day trip to Oxford to tie in the latest family focus these days, college visits. One of those teens is frightening close to college age. Museums, palaces, churches - we saw (and walked!) more than even I expected in that first week. Having studied for a year in Europe during college, and having returned a few times after that, it was still surprisingly how quickly I readjusted to the regularities of European travel after 20 years. The familiarity of the coffee, the pastry, the carafe of Rose, the trains, even my contempt when overhearing banal English conversations of other traveling Americans...it was all right there like muscle memory. The smoking too - the tabacs of France survive. Then there's so much new or new to me. Better restaurants, Uber, hotels with tiny elevators, driving in France, and winery visits. Actually, on my last trip to France in the '90s I visited Beaune and tasted at a couple of cellars in town, nothing fancy. And I took a day trip from Avignon to Chateauneuf du Pape and managed to discover for myself Domaine du Pegau, a revelation at the time for their red and white wine. Still, this trip marked the first planned and thought out visits to wineries. In all, I spared the family and managed to visit only three domaines, all in week two when we had rented a car in Paris and made our way through Burgundy, Rhone and Provence, with an overnight sneak to Piedmont that might have been the best stop of all. Each visit was particularly special, quality over quantity of stops, each particularly memorable. Back in Portland, I'm still reflecting on all I saw, learned, tasted, even read about - at the time and certainly since I returned. There's still so much to understand about it all, I hope the next few posts allow some processing - and sharing - of what happened and what it might all mean. For now, the recap of week one in brief - carafe upon carafe of Rose. Nameless, faceless, cheap Rose at dinner and sometimes lunch. Ok, not oceans of the stuff but just enough to wash down meals, with no concern for domaine or appellation. Just pale, crisp (usually) and delicious (also usually). And there was one red wine, we did cook in one night in London and I reprised college days with a bottle of cheap Cahors from the Tesco. Express. Nothing special at all, honestly it was sorta spoofy but in the moment is was fine. Then week two we rented the car and hit the countryside. More next time.